Page revised in January 2016. In 1648 the Peace of Westphalia brought to a close the Wars of Religion which had followed the posting by Martin Luther of his theses on the church door at Wittenberg in 1517. The treaty clauses were far from establishing religious freedom, but nevertheless they led to some acceptance of the different religious professions. In the early XVIIIth century a number of foreigners of different Protestant faiths settled in Rome. Although the small community was regarded with some suspicion it was given a burial ground near Piramide di Caio Cestio. Restrictions were imposed on the funerals which could only occur at night and with very little publicity. The site chosen was not very far from Ortaccio degli Ebrei (the Jewish Cemetery) in a part of Rome which, although located within the ancient walls, was actually a sort of urban countryside, remote from the city centre. In the last years of the XVIIIth century what was meant by the local authorities to be a sort of second (or third) rate burial ground became very popular among the foreigners visiting Rome: the Pyramid, the ancient walls, the simplicity of the site all appealed to the educated traveller who had knowledge of Gray's Elegy written in a country churchyard and of Macpherson's Poems of Ossian. 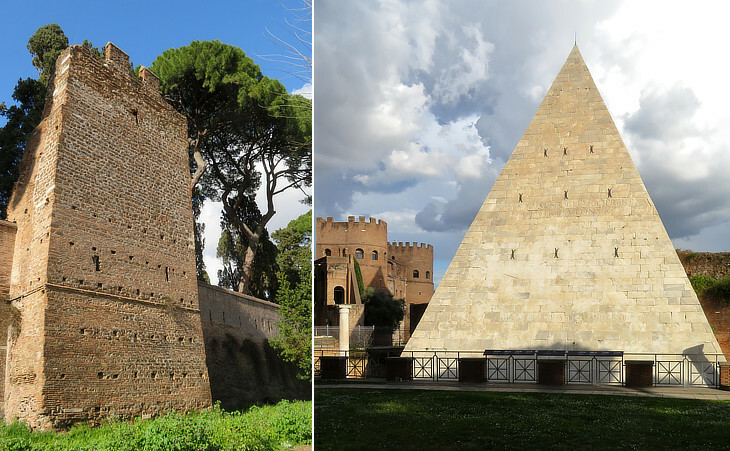 In February 1788, in the last days of his Italian journey, J. W. Goethe wrote: Should I be laid to rest beside the Pyramid of Cestius, these two poems ("Hans Sachs" and "Mieding's Death") will serve as my dying confession and my funeral oration. Given that at the time Goethe was in good health and in high spirits the sentence shows how much he liked the site of the burial ground. Cypresses and pines cast their dark shadows on the tombs, but palms and orange trees add a milder Mediterranean touch. In the early XIXth century the cemetery was enlarged and a new wall completed the protection given by the ancient ones. 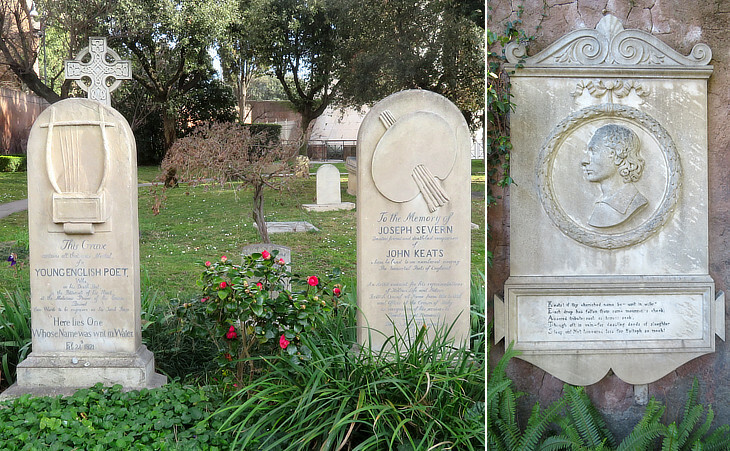 The oldest part of the cemetery is close to the Pyramid and here John Keats lies in an unnamed monument: Here lies One Whose Name was writ in Water is the epitaph he dictated to his friend Joseph Severn, a painter who wanted to be buried next to him. A relief portraying Keats is accompanied by verses, the acronym of which reads K-E-A-T-S.
K-eats! if thy cherished name be "writ in water"
S-leep on! Not honoured less for Epitaph so meek! 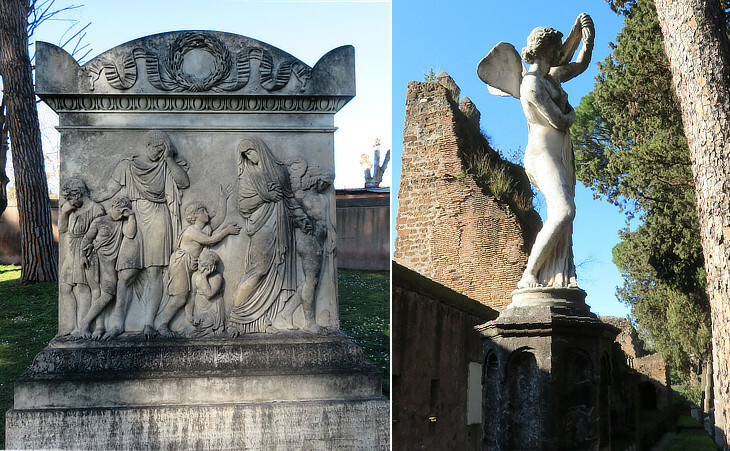 Although most graves are very simple, a few are rather monumental and especially those of the early XIXth century have fine Neoclassic reliefs: the image above shows on the left a relief portraying the Angel of Death bringing away a woman (Elisa, wife of George Watson, a lady from Massachusetts, or to be consistent with the Latin epitaph "Massachusettensis") mourned by her husband and children: all dressed as ancient Romans; the sculpture on the right portrays Psyche. 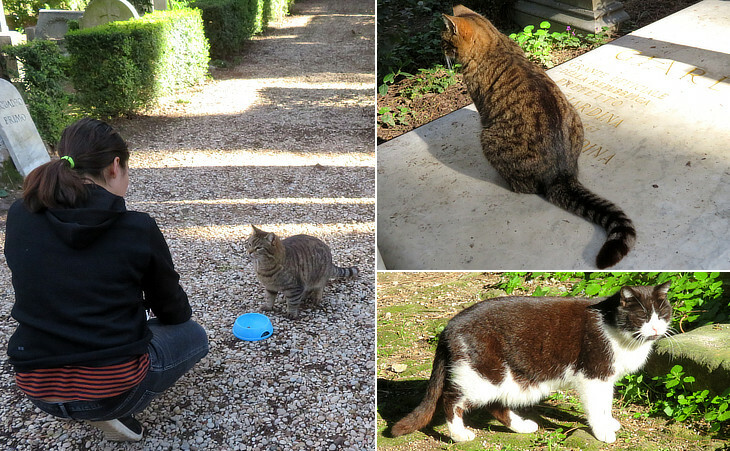 John Keats was not the only foreigner who came to Rome hoping the Italian sun would restore his health. 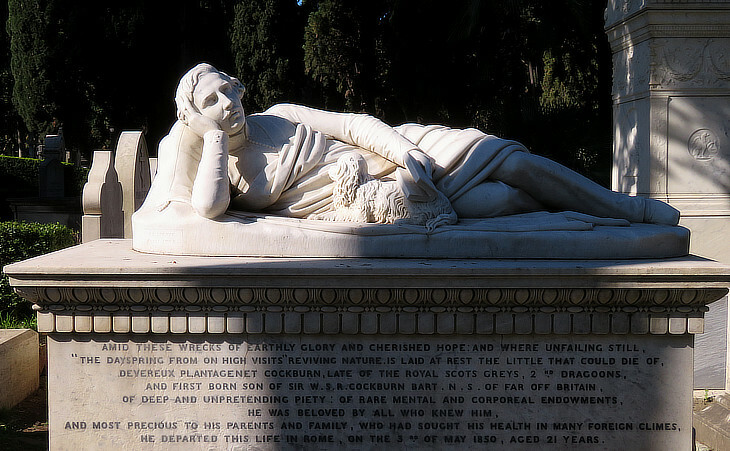 The young man (shown above) portrayed with his beloved dog and wrapped in a blanket "was beloved by all who knew him, and most precious to his parents and family, who had sought his health in many foreign climes. He departed this life in Rome, aged 21 years". One finds no rest elsewhere than here. but Rome alone completely satisfies. and not by accident of birth alone. AT TWENTY SIX YEARS OF AGE. IN ITS BLOOM.- SHE WAS EVERY THING THAT THE FONDEST. "EARLY, BRIGHT, TRANSIENT, CHASTE, AS MORNING DEW"
"SHE SPARKLED, WAS EXHALED AND WENT TO HEAVEN". The death of Rosa Bathurst was recorded by Stendhal in his diary and from it we know that Rosa was riding outside Porta del Popolo and that her body was found near Ponte Molle, so most likely she fell in the water near Acqua Acetosa or on the other side of the river along Via Flaminia. 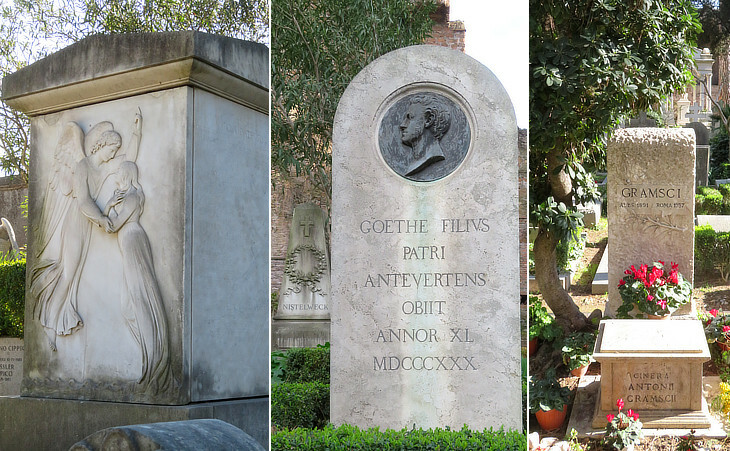 When Goethe imagined being buried beside the Pyramid, he did not know he had a foreknowledge that his son, born in 1789, would die in Rome in 1830 and be buried beside the Pyramid. The monument to Julius August Goethe shows how hard it is to be the son of a genius. 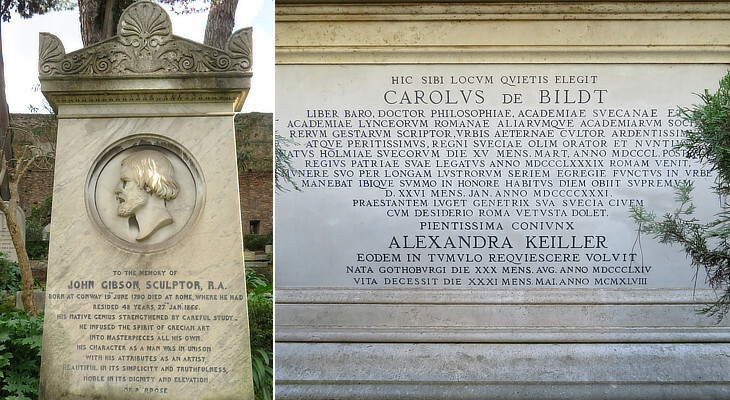 The epitaph does not mention his first name: he is just "Goethe filius" (Goethe's son). 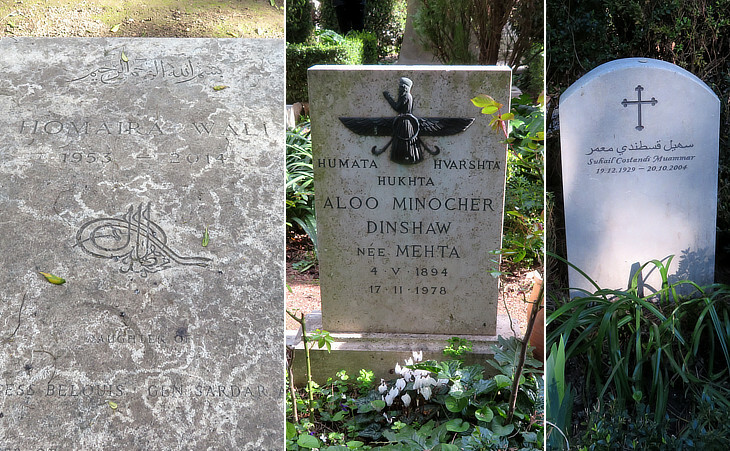 The cemetery is usually called Cimitero degli Inglesi, but its proper name is Cimitero Acattolico (non-Catholic), because in addition to Protestants it serves as burial ground for Greek Orthodox, Jews, Zoroastrians and atheists. The image on the right (above) shows the monument to Antonio Gramsci, one of the founders of the Italian Communist Party, deceased in 1937, after having spent many years in prison. Attending a Funeral ...and enjoying it!